Posts tagged "wild northern goshawk"
For weeks before I finally started, I’d been wanting to get started on the second northern goshawk in my series. It’s amazing how many things suddenly just absolutely have to get done when I decide to get started on a project. We have some frigid air moving in for the weekend, so I needed to put extra bedding out for the dog. Also wanted to bring in some extra firewood so at least tomorrow’s wood is sort-of dry when I wake up. The rick of wood is fairly green and the older wood in the pile is fairly wet. LOL, I can’t win either way with that. But, at least what’s inside the house will be a little drier by morning than it was this morning when I brought it in. So after taking care of the cold weather outdoor stuff, I thought I’d better fill some containers in case the water freezes. I don’t want to have to move the horses to the other field if their water bucket line freezes. Because that would mean I also will have to move hay in the frigid temperatures. I’d rather just haul the water to their bucket if that happens. Then I remembered I’d bought some peg board to make a vertical display space for my market booth. Before I could work on that it would need to be painted. So I painted the board and left it outside to dry. Except it didn’t. It was too cold for it to dry well and even after several hours had passed it was still tacky. So I brought it in to put in a warmer spot. Just before noon I remembered a letter I needed to bring down to the mailbox, so took care of that, And when I got back up to the house, figured I’d better put the car in the shop in case we really do get some of that giant hail I heard mentioned in the forecast. Well guess what? Now it’s coffee time. I completely missed lunch and so just let that go. Once I had my coffee I finished the vertical display space. Then, once that was done I did-finally-get started on my goshawk. It was all just procrastination. Though all of those things did need to be done today, I could have started the goshawk and done those things while stepping back from it. I step away from it almost every time I do anything significant to the painting. The eye is not finished. It’s just ‘good enough’ to hold the rest of the painting together while I go forward. I can’t do the bird until the eye is good enough. The northern goshawk (accipiter gentilis) isn’t commonly found in the Ozarks. Sometimes one might get blown off-course during migration, though. It is one of the raptors favored by falconers and I find them to be beautiful birds of prey. I did a few things differently on this painting. Each new painting is somewhat of an experiment with me, but there were some things I wanted to intentionally do differently this time. On the previous goshawk I had a really difficult time getting the angles right. So this time, on the photograph I printed out to work from, I drew lines with my ruler. These lines show me where the various parts of the bird line up in comparison to each other. I think that helped a lot. 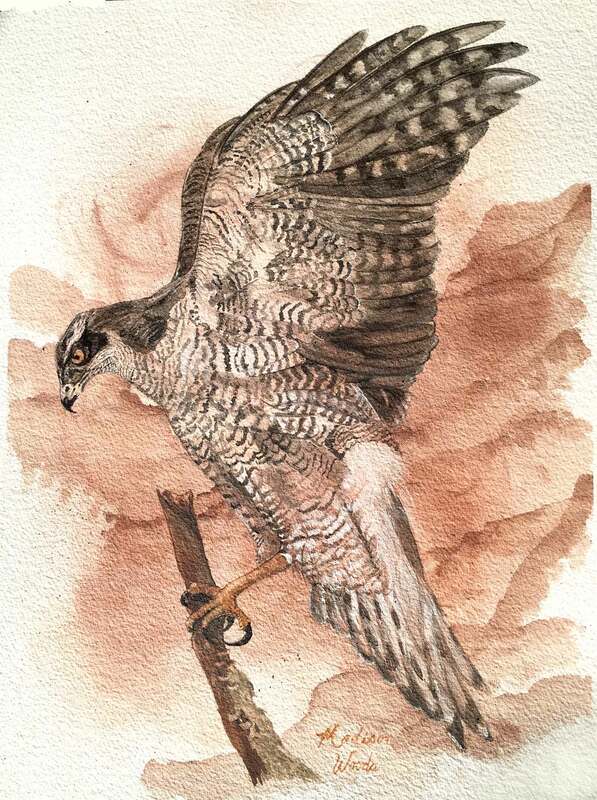 Another difference is that I’m painting this northern goshawk on a much higher quality paper. This time I have #300 (640 gsm) Arches paper and it is definitely a huge improvement. As it very well should be, because it was a lot more expensive. The pricey paper added to my reluctance to get started, I think. I’m afraid to ruin a sheet on a wasted effort. On the other hand, I couldn’t wait to try it out. The last difference is in the pigments I used for the background. I used some of the fine powders I’d processed and it gives a much bolder, color-drenched effect. I like it. But the particular shade I used is much more inclined to stain the paper. So the areas I need to be white later are going to be harder to produce. But that’s one of the sweet things about this paper. I can lift on it a lot more often than I could on the previous paper. Lifting is when you take color off the page with a damp brush by touching the spot and then rinse and wipe the brush-repeated until it’s white. Or in this case, white enough. I’ll never get the stain completely off. To get whiter spots on the bird later I’ll have to use some of my limestone paint. For this painting, I’m using a photograph of a wild northern goshawk by @javiersanzfoto (Javier Sanz at Instagram). Here’s the progression from start to current. As I can I’ll update the photo collection to bring it up to date. If you want to see it as I post them, follow me at Instagram (@wildozark). Sprinkling on the pigments to rub for the background on my northern goshawk painting. Pigment rubbed, hills taking shape. Goshawk no. 2 is soon to appear! The sketch of the bird is in the wrong place on the paper. Moved the outline to a better position. Still looks terrible at this point, though! My personal pans of paint from rocks. They get pretty messy with use. Let’s hope I don’t ruin the pricey sheet of paper!